The LongAmp® Taq 2X Master Mix combines high quality NEB recombinant Taq DNA Polymerase with a trace amount of Deep VentR™ DNA Polymerase. The 3´→5´ exonuclease activity of Deep Vent DNA Polymerase increases the fidelity and robust amplification of Taq DNA Polymerase (1). This ready-to-use mix offers two fold higher fidelity than Taq DNA Polymerase alone. A wide range of PCR products can be generated, up to 30 kb from lambda or human genomic DNA. Amplification of specific sequences from human genomic DNA using LongAmp Taq DNA Polymerase. 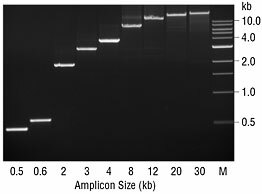 Amplicon sizes are indicated below the gel. Marker M is the NEB 1 kb DNA Ladder (NEB #N3232 ). 1X LongAmp Taq Master Mix, DNA template and primers in a total reaction volume of 25–50 µl. LongAmp Taq 2X Master Mix is stable for fifteen freeze-thaw cycles when stored at -20°C. LongAmp Taq 2X Master Mix is also stable for three months at 4°C, so for frequent use, an aliquot may be kept at 4°C. Barnes, W. M. (1994). Proc. Natl. Acad. Sci. USA. 91, 2216-2220. Saiki R. K. et al. (1985). Science. 230, 1350-1354. Powell, L. M. et al. (1987). Cell. 50, 831-840. Sarkar, G., Kapelner, S. and Sommer, S. S. (1990). Nucleic Acids Res. 18, 7465. LONGAMP®, and THERMOPOL® are registered trademarks of New England Biolabs, Inc.